Just an amazing view on a early spring day. The clouds were amazing. Enjoy! This was our view about a year ago. We drove from Salt Lake City to Yosemite. I am not sure what I was thinking, but I thought it was a shorter drive. If you look close, you will see the road winding down into the valley. We are planning our travel for 2019. We have three or four major trips planned, and maybe some shorter drives. They are mostly about the photos, and beautiful visits with nature. I know I have written this before, but I love drone photography. I was listening to a podcast a few days ago, and the host was talking about how limiting drone photography is. It’s true, for the most part it is a form of landscape photography, but there is something awesome about the perspective it brings to a photo that excited me. These photos are an example. I love that tree. I have photographed it before, but these two views, and that frozen, snow covered pond blow me away. 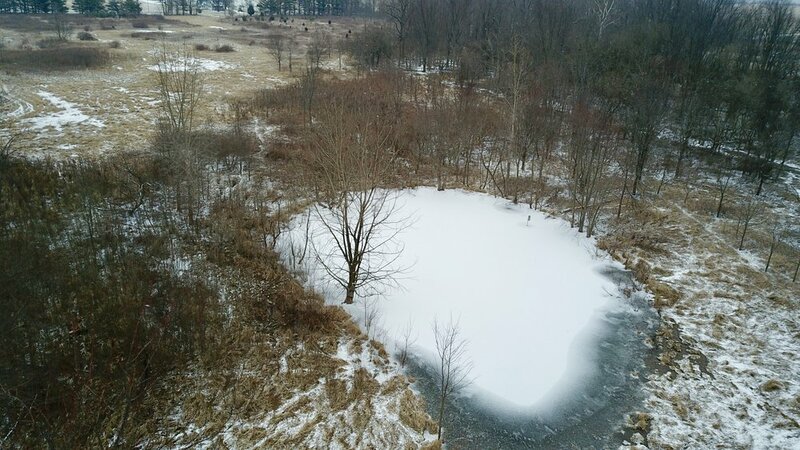 You can see the melting ice on the edges of the pond. The color transistions are intense in what seems to be a lifeless scene. When I look at it, I see a green heron and belted kingfisher that I photographed there several times last spring and summer. I see the cardinal that posed for me in that tree on many early summer mornings. In my minds eye, I see the ducks on tha pond on a fall day last year. These memories are vivid and lasting imprints that will endure for a lifetime. Yes, this is just a landscape photo from a drone. To me, it is memories. It is nature, dressed for winter, from above. In a few weeks, it will dress for spring. I can’t wait to fly a drone and capture that scene too. Enjoy every day, my friends. Hugs! 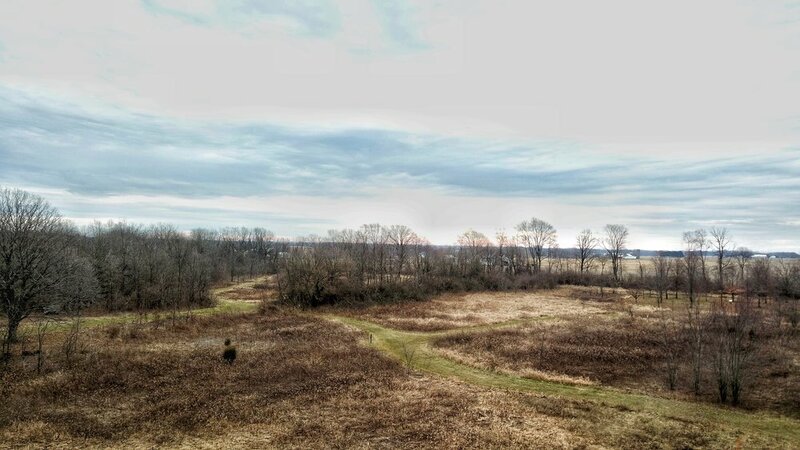 Snow is in the forecast, but for now we have bare trees and yellow / brown fields. It was a gray day, but there was some blue between the clouds. 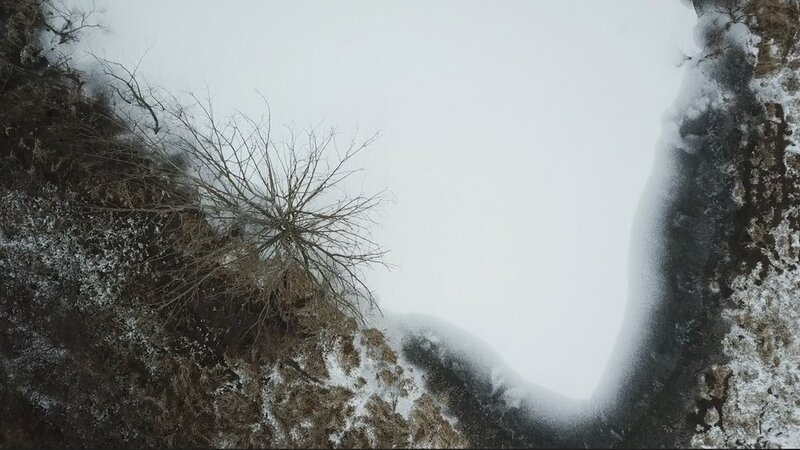 I took this photo using my drone, at about 75 feet. A little altitude .. getting into that vertical dimension adds to a photo. We had our first real snow of this season .. you know, where there is a slight snow accumulation. 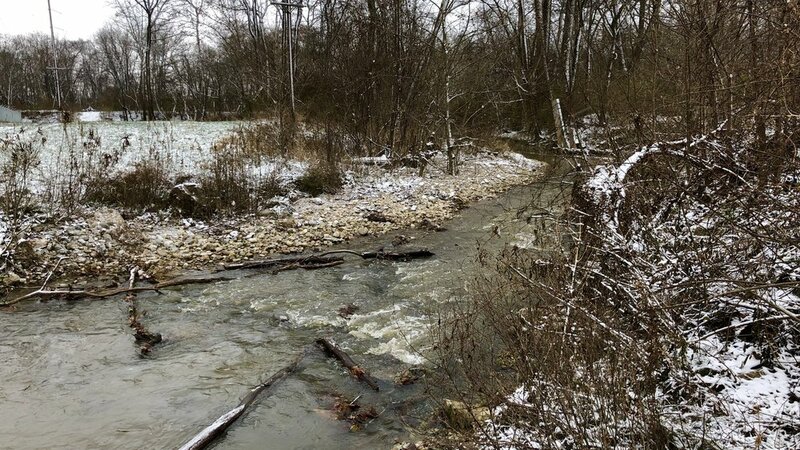 The rivers and streams have not started to freeze, but there was just enough of the white stuff to make it interesting.